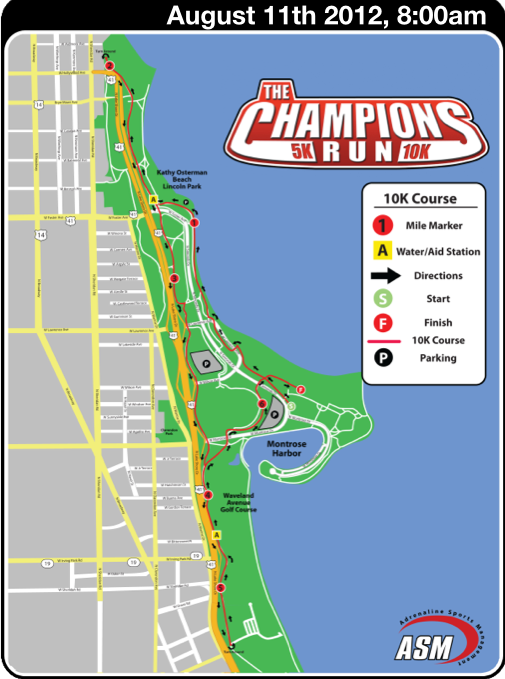 This morning's The Champions Run started a 10K weekend double-header that I've been looking forward to for a while (the second half is the Chicago 10K tomorrow). As a (really long) side note, I was also supposed to compete in the Chicago Shoreline Marathon relay this morning, but rough weather on Thursday and Friday and choppy water today led to the event being cancelled. Although I'm disappointed that it was cancelled I'm also glad that the race organizers are looking out for participant safety. I'm sure that others in the event may have been able to handle the choppy water, but it's definitely not worth the risk. I saw the water this morning during The Champions Run and it was pretty rough. Also, I've only had one lesson (which was just last week) and while I think I got the hang of it pretty well, I also think I better stick with totally peaceful water for a while. Wait... are we in Hawaii or Evanston? I found that this sport is not as difficult as it looks (as long as the water is calm) and is actually really relaxing and fun once you get going. It's like mixing surfing and kayaking. I'd definitely like to try it again some time. This morning's Champions Run 10K was almost great. As I said in my NewCity review, they had great freebies (breakfast, 312 beer, and even a pint glass with the race's logo) but there were a few big flaws that really brought the race down for me (and a few others I talked to after the race and heard muttering angrily to themselves during the race). For a reference point, check out the course map to the right. Forgive me, because this is going to get detailed and probably a bit complain-y. At the very top, just before the second mile of the course, there was a turnaround between Hollywood and Ardmore. When I got there I was probably in 40th or 50th place. There was a volunteer standing just north and to the side of this circular part of the sidewalk pointing to her right. And I could see that all the runners didn't turn around here but were coming back from farther north, so I kept going north past her. She didn't say anything or gesture to me or anyone around me. When I reached the end of the trail I turned left onto Ardmore following the runners in front of me. There weren't any race cones so we ran to the stop light and then turned around and headed back south. That's when I realized there were now only two runners behind me. We started talking and figured we had done an extra leg... and when we got back to where the volunteer was we could see that runners were now just making a loop and heading south from where she was standing. I had decided early on to take this one easier since I'm running the Chicago 10K tomorrow so I was annoyed but it didn't kill my motivation as it would have if I was going all out. The guy next to me vented all our frustrations, though by yelling "WHICH WAY DOES THE COURSE GO! DAMMMITTTTT!" to which the volunteer responded "I TRIED TO TELL YOU!" At that moment, even though I was annoyed too, I felt really bad for that volunteer. She probably hadn't volunteered at a race before and was clearly shy. When she saw runners flying past her she probably didn't know how to react except to vaguely point the way they were supposed to go... for this I blame the race organizers. For a turnaround like this they should have had more than one volunteer (and definitely someone who's not afraid to yell at people for going the wrong way). I'd estimate that this extra leg cost me about a minute and a half, which is pretty annoying. I tried not to let it get me down for the rest of the race and tried to just think of it as just adding a little extra exercise into my day. 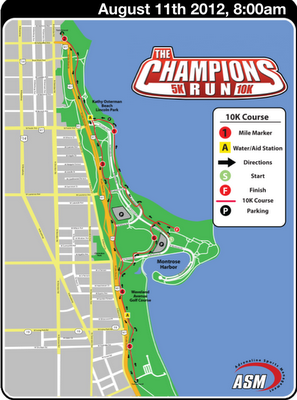 But then near the totem pole on the Lakefront Trail (the red dot near the bottom of the course map) the turnaround was literally just a volunteer standing beside the course yelling "TURN AROUND! TURN AROUND!" As I got closer to her I realized there was no marker and she was telling me just to turn around right then so I did... and almost ran into a biker. Usually I go to great lengths to avoid bikers (because I already hate hearing them yell ON YOUR LEFT and don't want to give them any other reason to be mad at runners) but this was definitely my fault and definitely something for that biker to put into his "runners are always in my way" memory bank. But it was just a bad place for a turnaround. Not since the United Run for the Zoo have I been this annoyed with a turnaround. Again, I don't blame the volunteer. She was making the best of a bad situation. I blame the race organizers for putting her there by herself (and for making that the turnaround point to begin with). Anyway... so that's my tale of woe. I'll stop whining now. But the post-race party was great. Great beer, great breakfast food, great music, free pint glass. I can't complain about any of that and I really wish I could recommend this race based on all its other merits, but poor course organization really impacts the runner experience. I talked to a few other runners afterwards and they had similar experiences (at both turnarounds) so I don't feel like I'm just making up a complaint. I even talked to two 5K runners who said there was some confusion at the northernmost turnaround for them, so there's obviously some work that needs to be done on this course and the organizational plans before next year. And one more thing. Styrofoam cups at the finish line?!?! I have never seen that and I hope not to ever again. Very weird... And they were all getting thrown into recycling bins. I have run the wrong way on a poorly marked course before and it is frustrating to say the least. Some charity races are bare bones with the staff and equipment. I guess paying an extra person and buying two turn-around pylons to properly mark the course would cost too much money. Otherwise, sounds like a good after-race party.